On Hospital Exit, Patients Don't Learn About Nursing Home Quality : Shots - Health News Hospitals often shy away from offering quality assessments about skilled nursing care because of a Medicare requirement not to restrict choice. Federal officials are weighing changes to that rule. 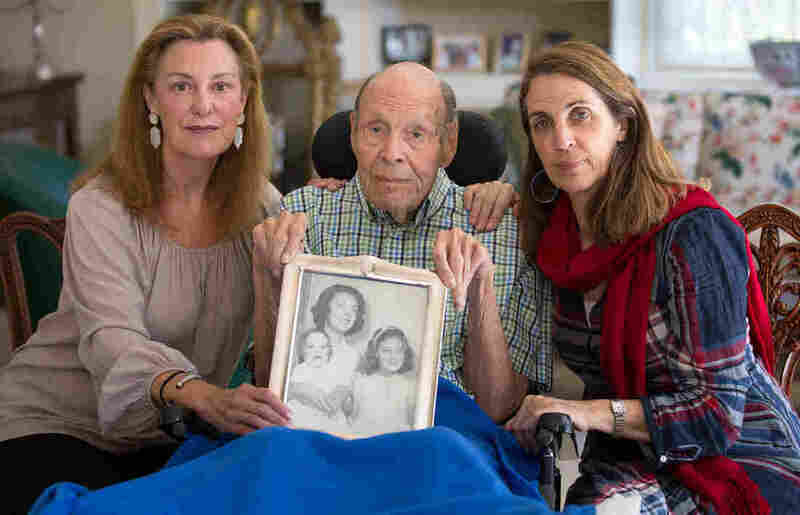 Laura Rees (left) and her sister Nancy Fee sit with their father, Joseph Fee, while holding a photo of his late wife, Elizabeth. "Hospitals are not sure enough that it would be seen as appropriate and so they don't want to take the chance that some surveyor will come around to cite them" for violating Medicare's rules, said Nancy Foster, vice president for quality and patient safety at the American Hospital Association. But hospitals' tight-lipped approach to sharing quality information may soon be changed. The Obama administration is rewriting those rules, not just for patients going to nursing homes but also those headed home or to another type of health facility. Hospitals will still have to provide patients with all nearby options, but the new rule says hospitals "must assist the patients, their families, or the patient's representative in selecting a post-acute care provider by using and sharing data" about quality that is relevant to a particular patient's needs for recovery. The rule was drafted in October 2015. The administration hasn't said when it will be finalized. Should it not be enacted before the end of President Obama's term, its fate becomes uncertain. President-elect Donald Trump has pledged not to approve new regulations unless two existing ones are eliminated. The quality requirement might have made a difference for Elizabeth Fee, an 88-year-old San Francisco woman who had been hospitalized for a broken hip. Her hospital, California Pacific Medical Center, told her family about its own nursing home but did not tell them that Medicare had given it one star, its lowest quality rating, Fee's family asserts in court papers. "I feel we were misled because we believed that Mom was going to a facility that would have given her excellent care," her daughter Laura Rees said. "And what she got was not even close to that, it was like night and day." A family photo of Elizabeth Fee shortly before her death. 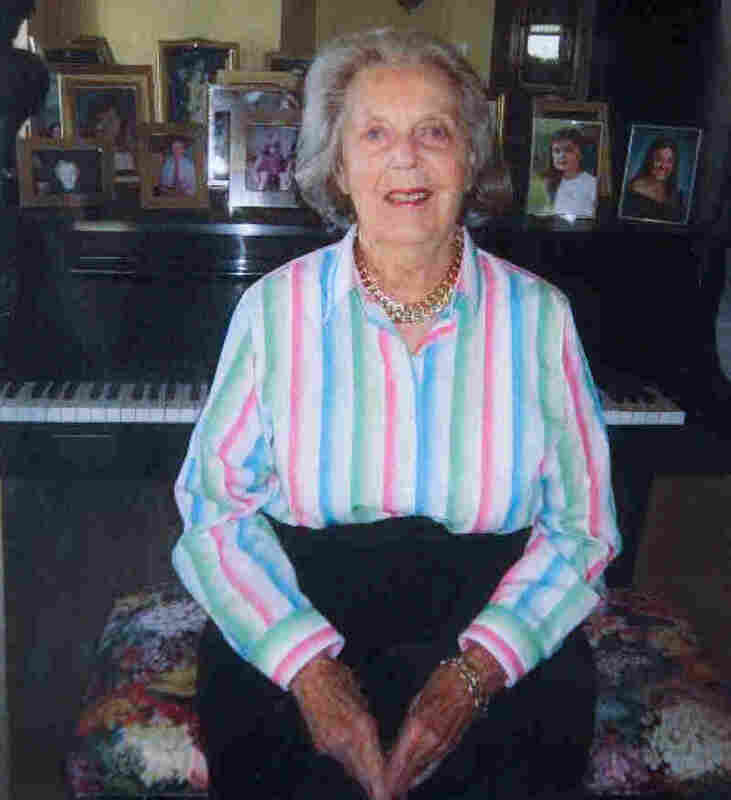 At the nursing home, Ms. Fee developed a bowel blockage that went undiagnosed until the morning of the day she died in February 2012. The nursing home and hospital have denied that they provided substandard care and declined to comment. The nursing home closed last year. Some health systems haven't waited for Medicare's rule change to increase the information they provide patients about prospective nursing homes. In Massachusetts, Partners Healthcare, which runs Massachusetts General and Brigham and Women's hospitals — two teaching hospitals for Harvard University Medical School — endorses 67 nursing homes around the state based on a host of criteria, including state inspections, readmission rates, location and how frequently a doctor or nurse practitioner is at the facility. Partners believes it doesn't violate Medicare's rules because it gives departing patients a complete list of nursing homes while noting on the list which ones are part of Partner's quality network, said Dr. Chuck Pu, a medical director at Partners. This fall, Partners dropped one of its own nursing homes from its preferred list after it got a poor inspection. "There's no free pass," Pu said. More careful attention to nursing home quality has been encouraged by existing financial incentives created by the Affordable Care Act that cut payments to hospitals if too many patients are readmitted within a month. "The whole idea of preferred provider networks is really going to escalate in the future," said Brian Fuller, an executive with NaviHealth, a consulting company for hospitals that focuses on patient care after discharge. Foster, the hospital association executive, said the proposed Medicare rule should make hospitals less wary about giving more detailed guidance. "This signals that it's okay for knowledgeable folks to really engage in that conversation with patients and their families," Foster said. Kaiser Health News is an editorially independent news service supported by the nonpartisan Kaiser Family Foundation. You can follow Jordan Rau on Twitter: @jordanrau. A previous version of this post incorrectly said Elizabeth Fee, a nursing home patient, died in January 2012. She was admitted to the facility that month, but died in February 2012.